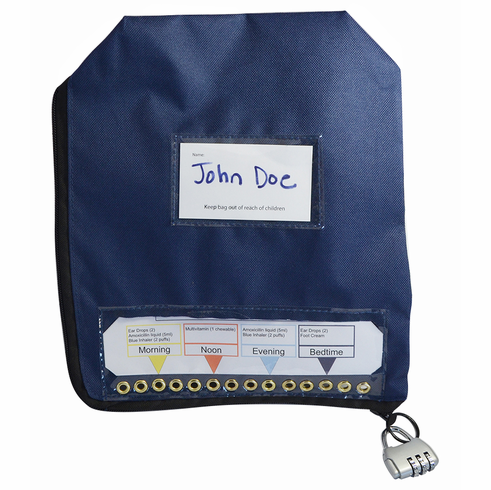 Use your e-pill ZipperSure �locked medicine organizer bag� at home, for travel or at school (college). (click to enlarge image). Can be used for Methadone Take Home bottles. Avoid Medication Errors and Feel Better: Restricts Access to your medications. The position of the lock indicates when you should take your next dose. The e-pill ZipperSure is a practical way to store all of your medications in their original container, so there is no need to sort in a pill/medication organizer. Labels remain intact with your meds. Size: 11 inch x 9 1/2 inch.